Thanks to its fibre core, our 6×19 fibre core tower crane wire rope is lighter and more flexible than its steel-cored equivalent. Ideal for less strenuous lifting applications, it is part of our broad selection of crane rope that covers every type of lifting equipment you can imagine. 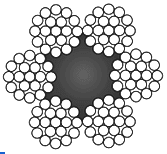 As already mentioned, opting for a fibre core will mean that the mass per meter of the rope is quite a bit lower than other types of wire rope. If weight is an issue, then choosing this variety of rope for your tower crane will make sense. You will have to accept lower minimum breaking load limits as a compromise for this design, but on the upside you will also enjoy improved flexibility and overall durability, since the material will not fatigue as quickly. If tower crane rope is not on your radar, then we can still supply wire rope for other examples of lifting gear. This includes mobile lattice boom crane rope, piling crane rope, ship crane rope and everything in between. Each rope has its own unique strand configuration, treatment and properties to weigh up, so contact Rope Services Direct if you have any queries. Take a trip to our contacts page if you need to ask us a question, request a quote or get additional technical details about our products. You can also call 01384 78004 to talk to us over the phone. 6x19 Fibre Core Tower Crane Wire Rope Overall rating: 5 out of 5 based on 6 reviews.